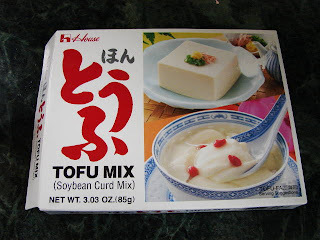 One of my store cupboard essential is this instant tofu pack. It is very handy when I need silken tofu quickly. Great for steaming. This tofu is very soft not suitable for frying. 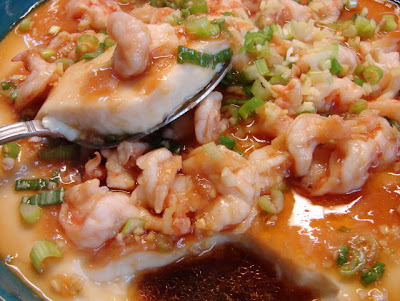 One of my favourite use of this tofu is steamed savoury tofu with prawn or minced beef. Follow the packet instruction boil the soya milk and add the coagulant, pour this straight into a deep dish, cover and leave to set and cool. Set the steamer on, steam the tofu only for about 6 - 8 minutes till the tofu is hot, use a piece of kitchen towel to absorb any moisture on top of tofu so the sauce is not too watery. Discard paper. 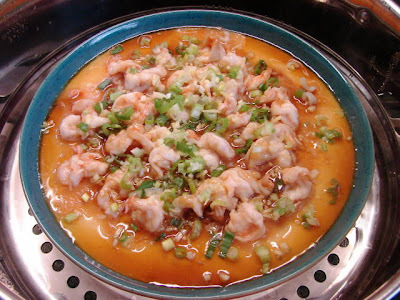 Spread the prawn on top and steam for about 4 - 5 minutes till prawn is cooked or turned milky and pink. * You can sub prawn with minced lean beef. Gosh - what an AMAZING blog! I'd KILL for that tofu - many thanks for sharing so freely, i look forward to trying the recipes. Mum used to use that packet to make Dou-Fu Fah when we were little! Delicious! So smooth and silky! It's a nice convenient food but getting quite expensive. Better price in JapanCentre (London), they sometime have it on offer too. Yeah, Mum would stock up on packets of the stuff from London. She hasn't made it for years. JapanCentre (London) - was that a shopping centre with chinese restaurants and a supermarket? I think that later became known as Oriental City. Either way it closed in June 2008. Alternatives would be Wing Yip in Cricklewood. Have you tried making your own tofu? Apparently, my husband's mum would make it at home with a cloth and sieve - no fancy square tofu moulds. JapanCentre is in Piccadilly, walking distance from China Town in London. Oriental City has been closed for ages, it used to be a Japanese store called Yaohan Plaza. I also make my own tofu fa, will post the recipe later.